What is advanced care planning (ACP)? This section aims to support your understanding of the role of palliative and end of life care for clients with advanced ill health. It considers what palliative care is, who provides it, how it could benefit you and your clients and how you can access it. It also considers the types of assessment and tools that ensure clients with advancing poor health receive the best quality of life and outcomes. Until recently specialist palliative care services have rarely been involved in the care of homeless people with advanced ill health. There is however, a growing understanding of the need (and a commitment) to change this and do more. Hospices and community palliative care teams want to become more involved in supporting homeless people, alongside GP’s, community nurses, hospital teams and social care agencies, with the aim of providing a more individual person centred approach to care. Some great examples of how homeless people with palliative care needs can be supported can be found in the Care Quality Commission (CQC)’s report, A second class ending: Exploring the barriers and championing outstanding end of life care for people who are homeless. At the moment, there are very limited appropriate and acceptable options for place-of-care for people who are homeless with advanced ill health. Therefore, there is a need for structured and coordinated responses from everyone providing care. You can help clients to access services by flagging your concerns about their deteriorating health early on to health care professionals. This will help in identifying their current needs, and provide an opportunity to plan for their future care, plans that may eventually lead to more specialist palliative care input. The exploring the benefits of palliative care input activity sheet can help you gather your thoughts about if, or when, a client may benefit from this type of support. The ‘“who can support you?” tool may also help you identify the different types of support available to you. The tools supporting multi-agency working within the shared care section, along with this “health monitoring” tool, can be helpful in montioring and requesting palliative care input at different stages in a clients illness trajectory. Acknowledge that there will be uncertainties in predicting end of life for clients with illnesses such as advanced liver disease. Even if, after you raise a concern, and a client’s GP, consultant or medical team assess that they do not meet the referral criteria for palliative care input, this can change. You can re-approach these medical professionals if you see that things are getting worse or a client’s needs are unmet. Palliative care may be just a little further down the road. Keeping a log of your observations can be a very helpful reference for the multi-agency team. The “health monitoring” tool could be helpfu herel. Plan ahead to manage barriers and challenges that may arise. Considering a client’s future care needs, alongside current needs, can be done before a referral to palliative care support is made (for example, thinking about whether it might be appropriate to involve social services). This identifying clients of concern activity sheet, the planning care at home checklist, and the client of concern project checklist could help in creating a structured and coordinated way of supporting clients with complex needs. Contact the specialist palliative care service in your area. Explore the support available locally and find out how other services can support you, your clients and your team. Invite someone from the specialist palliative care team in your area to a multi-agency team meeting to learn about their service, and they about yours. The Hospice UK website can help you to find your nearest hospice. Consider advance care planning (ACP) and its benefits. How might advanced care planning (ACP) ensure your client’s wishes and priorities for care are known? Who can you explore this further with? Which conversations can be initiated by you, by another member of the multi-agency team, or shared? As capacity plays an important role in (ACP), particularly for those clients with chronic alcohol related issues it may be helpful to seek advice from others within the multi-agency team, such as addiction psychiatrists, GPs, district nurses, or specialist palliative care nurses. Information on mental capacity and advanced care planning in this section can help you explore the role of mental capacity in supporting clients with deteriorating health, and the on-going choices they make about their future care. Palliative care takes a holistic approach to care and support for people with advanced progressive illness for which cure is no longer possible. It considers the physical, psychological, emotional, spiritual, social and cultural needs of the person, and everyone involved in a person’s life, such as family, friends and carers. As someone caring for a client this can include your project team. Palliative care also emphasises achieving the best quality of life, in which open and sensitive communication plays a key role. 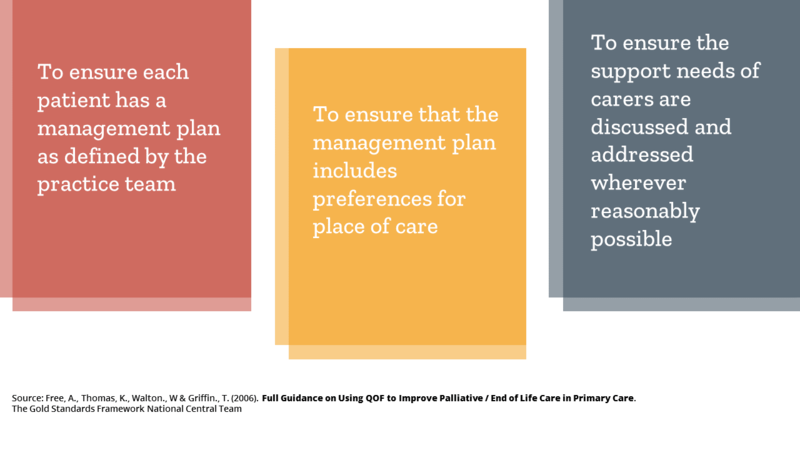 Personal care plans are an important part of palliative care that helps to preserve a person’s autonomy and choice by documenting their personal needs and wishes should their condition deteriorate. End of life care is an important part of palliative care for people who are considered to be in the last year of life, but this time frame can be difficult to predict. It aims to help people live as well as possible and to die with dignity. It also refers to treatment during this time and can include additional support, such as help with legal matters. End of life care continues for as long as a person needs it. For more information see Marie Curie. Palliative care aims to address four key areas: the physical, psychological, social and spiritual needs of an individual and the people supporting them. Physical needs: making the person comfortable by making sure any pain and symptoms are well managed. Psychological needs: making sure that a person has the chance to talk about any worries or concerns they have, and providing emotional comfort. Social needs: making sure that a person is connected to others that are important to them. Spiritual needs: making sure that a person is cared for in a way that fits their beliefs (not just religious beliefs). There are a whole range of services and professionals that can help to support the physical, psychological, social and spiritual needs of clients with advanced ill health. These include GPs, community nurses, hospital teams and social care agencies. There are also specialist palliative care teams and services, who can help support you and your clients. These are usually found in hospices, hospitals, some out-patient clinics and day centres, or community settings. A palliative care team can provide a range of supports to you and your clients. However, the support provided is likely to vary from location to location, or be offered on an ‘as-and-when’ basis. This means the service provision could dip in and out over time according to a client’s changing needs (as might be the case for clients with advanced liver disease for example). The specialist team’s support is also likely to increase as a client approaches the end stage of life, and may extend to additional support being provided by a hospice in-patient team or hospital palliative care team. Co-ordinated support for clients with high support needs, and the people supporting them, at their place of residence (Hospice at home). A client’s current and future palliative care needs – parallel planning, advanced care planning, and personal care plans. A client’s GP or hospital consultant can seek the advice and support of the community and hospital specialist teams around symptom management (e.g. pain or nausea), particularly where the symptoms are complex. This could include managing a complex situation involving pain relief in association with long-term drug and alcohol use. Clients may be able to access local hospice support, including review and assessment of physical needs, emotional and psychological support, creative and complementary therapies and advice on benefits. Support may also include short stays within the in-patient hospice unit for symptom management or respite, or to be cared for at the end of life. A specialist palliative care team can also provide care and support to you and your team. This includes practical advice, as well as psychological and emotional support. With the same commitment to providing support to families, the team are most likely to recognise the significant relationship you have with clients, and how many may perceive you and your colleagues as next of kin. Anyone can refer any person with a life-limiting illness to specialist palliative care services, although it is usually done by healthcare professionals. The patient has active, progressive advanced disease; a limited prognosis; and the focus of care is on quality of life. The patient has unresolved complex needs that cannot be met by those providing care (e.g. GP, hospital consultant, district nurse). These needs may be physical, psychological, social and/or spiritual. Examples include complex symptoms, difficult family/home/project situations, and ethical considerations. Share any concerns about a client’s poor health with the multidisciplinary team early on, even in the absence of diagnosis or prognosis. Many healthcare professionals may not know what a client’s environment looks like, or the challenges of supporting them in the project. Together you can explore the potential benefits of palliative care. Use the information and tools and activity sheet in the identifying clients of concern section to help you consider clients who may benefit from palliative care. Use the information and tools in the shared care section to help you think about who or what can best support you and the client, and any conversations you may need to have about specialist palliative care input. The who can support you tool, and the multi-agency working activity sheet in particular may be helpful. Gary was a 32-year-old man admitted to hospital having collapsed at his project. He had been an intravenous drug user (IVDU) for a number of years. He was diagnosed with sepsis (infection in his blood) and also infection of his heart valves. It was felt he may need a surgical replacement of his heart valves. Gary was treated in hospital with intravenous antibiotics. The seriousness of his condition was discussed with him and he was told that he would need antibiotics for a number of weeks. He was also told that it was unlikely he would get better without having surgery. Gary decided to go ahead with the surgery. A date for surgery was planned, but in the meantime Gary was found injecting into the cannula in his arm, which had been inserted for administering the antibiotics. He became very unwell and the sepsis worsened, resulting in his kidneys failing. He was now so sick that he wouldn’t survive surgery and he was told he was dying. The medical team contacted the hospital palliative care team and Gary decided he would like to remain in hospital. He had a single room and his friends and keyworkers from the project came to visit. Gary had an opportunity to discuss his last wishes, but did not want to reconnect with any family. He died peacefully in the hospital two weeks later. The project staff worked with the hospital bereavement service to make arrangements for his funeral. Some causes of death are more difficult to anticipate and plan for. For some, such as an accidental overdose, a suicide or a fall, death will be perceived as sudden, with limited opportunity to prepare, or say goodbye. For others, as with Gary, even though death can be anticipated, there may only be a matter of days or weeks of life remaining, depending on the circumstances surrounding their illness. People in these situations often remain in hospital due to the seriousness of their condition. With an early coordinated response that includes input from the hospital palliative care team, quality end of life care in a hospital is possible. For Gary, project staff had been included in discussions with the medical team about him dying. This may not always be the case, particularly where a client is not conscious and project staff are not listed as next of kin. In such situations, it’s important for project staff to let the medical team know of the significance of their relationship to the client, and the project, especially in the absence of next of kin. A client’s GP practice may hold a register of all patients with palliative care needs. The palliative care register exists to make sure all patients who have been identified as palliative have their needs and care plans regularly considered. The register also aims to improve communication about patients both within the multi-disciplinary team, and with external agencies providing care to a patient, such as a care home, hospice, hospital, and ambulance services. This can also include the project in which a client is residing. Currently, not many people experiencing homelessness are likely to be listed on the palliative care register, particularly diagnoses other than cancer, where there may be less certainty over prognosis. Share your concerns about any notable changes in a client’s health with their GP or other key professionals.The client’s GP can advise if and when a client might be placed on the palliative care register or referred to the palliative care team. Using the identifying clients of concern sheet may be helpful for thinking about the main challenges the client faces, before speaking with their GP or others from the multi-agency team. The principles of palliative care are the same for everybody, but palliative care for people who are homeless can be different. Many clients requiring palliative care have ongoing complex needs, behaviours, and substances use issues. Current models of care, (i.e. recovery, medical, addiction models), may require some re-thinking in order for clients to access fully the necessary care and support they need. Are there aspects of the current models of care you work with that might require change, and that of other services? The considerations below for the main services providing care and support may help. What are the challenges for homeless services? Many services that support homeless people focus on recovery – helping people to move out of homelessness into more independent living. Supporting clients within the recovery model is going to feel different for clients with advanced ill health. At some stage in their illness trajectory a shift in emphasis toward quality of life is likely to occur, as the model’s more traditional aim of moving toward independent living becomes less of a reality. This does not mean that goals are not to be encouraged. On the contrary. Helping clients to plan for the future will just have a different focus as they consider what matters most to them should their health deteriorate further. It can include as much the possibility of slowing down or halting their illness progression at some point in the future, as it can the wish to be able to live well, and die well in the manner and place of their choosing. Adopting a parallel planning approach to care could be helpful here. You could consider encouraging goals that are more short – and medium term, and do so at a pace clients feel comfortable with. You could also consider the possibility that the project could become a place of care in the absence of alternatives as a client’s health deteriorates. The planning care at home checklist may help you with this. How does the recovery model of care impact on the way you ordinarily perceive your role and responsibilities? How can it be adapted to best meet your client’s palliative and end of life care needs (e.g. changes to current policies and procedures within the project)? Who from the multi-agency team could support your project with this? What are the challenges for medical and nursing services? Healthcare professionals may need to recognize the need for palliative care much earlier on for homeless people with advanced ill health, particularly given the uncertainty around some illnesses in predicting end of life, such as advanced liver disease, or lung disease. A client’s GP or hospital consultant may still hope the client’s illness could potentially slow down if their behaviours and symptoms can be managed, for example if they abstained from alcohol for an extended period, or complied with particular treatments and procedures (e.g. chemotherapy). While this may be true for some, many will struggle to stop drinking, access treatments, or find it hard to take appropriate actions to take care of themselves. We need to consider how best to support clients that cannot or do not want to change their behaviour, as well as those that can and do. It’s important to talk about your concerns early on to healthcare professionals. This multi-agency working activity sheet, multi-agency prompt tool and health monitoring tool could help. You could use these tools to outline the ongoing challenges clients are experiencing, any notable changes in their health, and the environment they live in; as medical professionals may be unaware of these issues. What are the challenges for alcohol and drug services? A client with advanced ill health, if medically assessed as appropriate, may benefit from the offer of a detox and rehab programme in the last year of life. This may help increase life expectancy by some months, or even years. Even detox alone can provide opportunities for clients to reflect on where they are in their illness trajectory, and the options for change open to them. It can also provide an opportunity to reflect on their end of life care needs and wishes, or provide some welcome respite from the symptoms they experience with their illness. Sometimes it can be difficult to secure access to these services for people with life-limiting illnesses, particularly where timing, and motivation run differently to the normal assessment and funding criteria. Another common challenge is the lack of alcohol-free residential options (‘dry’ facilities) for clients awaiting a package of care for rehab. This is a particular problem for clients returning to projects from hospital where alcohol is permitted. Assessing the needs of clients with advanced ill health may feel different to assessments usually done with clients in better health. The focus may move towards helping clients achieve the best possible quality of life, as opposed to longer term goals like ‘move on’ or recovery. Considering and planning for different options now, and in the future, and keeping options open for change, is at the heart of any conversation or assessment you and the multi-disciplinary team undertake with clients. It is often referred to as parallel planning. It is often hard to predict what the future holds, particularly when someone has an illness that comes with a lot of uncertainty, like advanced liver disease. Some people are at risk of an unpredictable and potentially terminal event during periods of relatively good health. On the other hand, someone may be extremely vulnerable and living with significant health needs, but may go on to live for months and years. A parallel planning approach means that various options for care are considered, taking into account different things that might happen. Talking about these options means that people have the chance to discuss what is important to them and what they would like to see happen if they became very unwell. Hoping for the best (‘planning for life’) while also planning for the worst (deterioration or death) may enable a good quality of life to be achieved, and plans to be put in place in case the person should become more unwell. It also considers keeping options open for someone to change direction at any point in their illness. This possibility of change, and therefore of not losing hope, is very important. For example, a client with advanced liver disease continuing to drink with the hope that they can at a future stage stop drinking. Palliative care, and other members of the multi-agency team can help with parallel planning for clients’ future care needs, working towards ensuring they receive the best quality of care to live well in the manner and place of their choosing for as long as is possible. Our research on this outlines how a parallel planning approach could be helpful for homeless people with advanced ill health. The information in the communication section of this toolkit could also help in preparing for and having conversations with clients about their health and wishes for the future. Clients’ understanding about their health, prognosis and treatment options at different stages in their illness. What truly matters to them, i.e. what are their preferences and wishes? Current helpful strategies that can be encouraged, or new ones to consider. How well can a client engage with services, particularly as their needs increase? How open they are in talking about their health and concerns. What mental, psychological or behavioural issues are impacting their health? Do you or the multiagency team have any concerns about the client’s mental capacity? Share concerns early with key healthcare professionals, a capacity assessment may be required. Who is significant to the client – who can provide emotional and practical support? Consider the tools and resources in the communication section of this toolkit to explore with clients the aspects of their lives they are most concerned about. 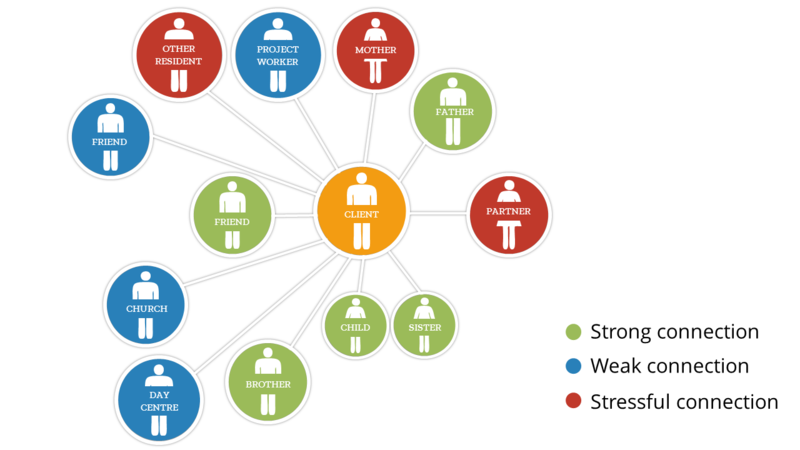 An Ecomap could be helpful in understanding a client’s relationships with others.This can help identify who else could provide emotional or practical support to the client. Although a particular relationship of the client’s may appear stressful, that person may still be important to them.This needs to be acknowledged when planning care and support. Completing an Ecomap can also be an opportunity to open up conversations with clients about what really matters to them. For instance, opportunities to reconnect with people they had lost contact with. It may also include an expressed wish that someone not be involved or contacted. It can also help us consider the needs of people who are important to the client, including after the client dies. The bereavement section of this toolkit may help. Consider early on what the likely challenges are in providing care for clients at the project, and the possibility of limited or no alternative places of care. The planning care at home checklist and the client of concern project checklist, could help you to consider what works well, and what concerns you might have. Be realistic about what’s achievable. Clients will generally see you are doing the best you can to support their wishes, even if some are never realised. Are there any adaptations required that might enable the client to be cared for in the project? If so, assess early on what these might be. Small adaptations can often bring big changes. For example, moving the client to a ground floor room in the project, or a room with an on-suite bathroom if needed. Are there any safeguarding or practical issues, such as the storage and collection of medicines, preparing meals, and looking after the best interests of the client? Does the client need help with personal care? If so, has a referral been made to social services for a Care Act Assessment? Might the client require out-of-hours access to health and social care services at some point? Would you know who to call if the client deteriorates rapidly? Does the client have an emergency care plan? If not already in place, discuss the need for an end of life care policy and procedures document. Could someone from the multi-agency team support you with this? How might the client’s illness impact other clients and staff? Assessments might consider the impact a client’s advanced ill health on you, other clients’ peers, friends and family. Does the client have peers who are in poor health themselves? One person’s deteriorating health may mirror others’ perceptions of their own mortality and future. That aside, many clients are likely to rally round their peers/friends and want to do everything they can to support them (consider using the Ecomap with them). Some clients may have developed poor coping strategies to deal with difficult situations or emotions in the past (such as drug or alcohol misuse to block out distressing emotions). Are you aware of any worsening or difficult behaviours among other client’s? Do you have support to help with this? The who can support you tool can help. Supporting clients who are very ill may impact how you and your colleagues manage your everyday tasks and responsibilities, and also affect you on an emotional level. The resources in the self care section of this toolkit could help you to recognise and address signs of stress at work. While never giving up on clients, accepting what you cannot change can be helpful. Not all problems can be solved, and clients may need to use their own coping strategies and defences to manage their poor health. Supporting clients who are potentially dying may not be something everyone naturally feels comfortable with. Is this something that you can take into account when working with clients with advanced ill health (such as in the allocation of tasks, and how you support yourself and each other)? Review from time to time a client’s understanding about their health, particularly when there are notable changes, or following an admission to hospital. If you are concerned about a client, explore this with them, and others early. Planning ahead for every possible eventuality is just as important as meeting current needs. Consider using the planning care at home checklist and the client of concern project checklist to help you think about, and plan for a client’s care at the project, including any challenges or obstacles that may arise. Use the exploring the benefits of palliative care input activity sheet if you have concerns about a client. This activity sheet aims to help you explore with a client’s key health and social care professionals the support a client may require. Consider the skills and resources within your own team, and the multi-agency team to manage difficulties that may arise when providing care at the project. The multi-agency working activity sheet and multi-agency prompt tool can help with this. How could the multi-agency team help in supporting client’s with deteriorating health? The main support a client receives externally may come from those already providing care, such as their GP, hospital team and social services, with others coming on board at different stages to reflect their changing needs, (e.g. a specialist palliative care team). Clients with ill health should receive medical assessments as a matter of course, but further assessments are sometimes required if applying for additional funding or benefits – see below. Some homeless projects are also beginning to host regular meetings that are attended by a range of different health and social care professionals (multi-agency meetings) during which clients of concern are discussed. Ideally someone from the palliative care team (perhaps from your local hospice) could come to these meetings too; this might be especially helpful if you have several clients with advanced ill health. 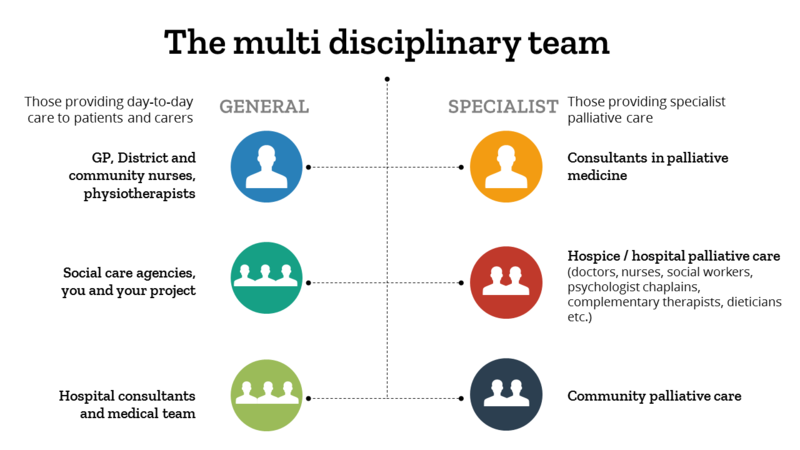 In this model, a client doesn’t need to specifically consent to being referred to palliative care before they are discussed within the multidisciplinary team (MDT). Here are some of the main assessment tools used by healthcare professionals. Continuing healthcare funding (CHC) from the NHS was designed to meet the ongoing physical or mental health needs of adults with a disability, injury or illness and can also be considered for anyone approaching the end of life. It is sometimes referred to as fully funded NHS care. Fast track CHC funding – normally applied for within the last few months of life. The service is needs-led, and a combination of both health and social care. Includes such things as increasing levels of personal care, medical equipment and aids (e.g. hospital bed). When fast tracked, an appropriate package of care is in place quickly (normally within 48 hours). Care includes limited 24-hour care where needed, usually in the last weeks or days of a person’s life. CHC applications are normally completed by a senior clinician (i.e. GP, consultant, palliative care or district nurse). A full assessment is then undertaken by the local clinical commissioning group (CCG). If approved, a client will be entitled to an ongoing, fully-funded package of healthcare. It can include care where the person lives and there is an avenue for fast-track processing for people with a rapidly deteriorating condition who may be entering the last 6 months of life. Care is either directly arranged by the NHS, or received in the form of a Personal Health Budget (PHB), see below, which allows recipients to choose the care they receive. For more information on CHC, see Age UK’s factsheet and NHS Choices’ webpage. Personal health budgets (PHB’s) were introduced in 2014 as an alternative to the way fully funded NHS care is provided to those in receipt of continuing healthcare (CHC). It was introduced to enable people with long-term conditions to have greater choice, flexibility and control over the healthcare and support they receive. Be able to choose the health and wellbeing outcomes they want to achieve, in agreement with a healthcare professional. Know how much money they have for their healthcare and support. Be enabled to create their own care plan, with support if they want it. Be able to spend the money in ways and at times that make sense to them, as agreed in their plan. PHB is something not yet widely accessed within the homeless sector, partly because of the struggles within some CCGs to recognize a project as home, though this perception now appears to be changing. It can benefit clients with long-term illnesses, particularly those with conditions such as advanced liver disease, as they are likely to present with increased symptoms that indicate a deterioration, and struggle to manage much of their day-to-day health and social care. If approved for CHC, speak with the client about the option of PHB, as it may give them more autonomy and control over the type of care they receive. Clients may also be entitled to a Personal Independence Payment (PIP). Though a tax-free benefit for people aged 16–64 who have a long-term illness or disability, people with a terminal illness can also apply under special rules. An additional benefit called a DS1500 can be applied for in someone’s last months of life. The GP, district nurse, or palliative care team can support your client with this. Anyone can set up a multi-agency meeting, they don’t have to be called or started by healthcare professionals. Consider setting up and facilitating a multi-agency meeting if or when you have notable concerns about a clients health, or place of care issues.The multi-agency working activity sheet and the multi-agency prompt tool, can help with this. John is 58, and has lived in and out of projects since his 20’s. He was on methadone and continues to intermittently inject drugs. Until recently he was living in semi-independent accommodation. For a number of months John had been suffering from severe back pain and pain in his legs, but as he has a fear and distrust of medical services, he was reluctant to seek help. He was eventually admitted to hospital because he was in so much pain that he wasn’t able to move around easily. He was diagnosed with lung cancer, which had spread to his bones and liver. He was in a lot of pain. He was treated with radiotherapy but his pain was very difficult to control. Prior to admission John had been finding it increasingly difficult to climb the stairs to his flat. He also needed support with cooking and shopping, but was fearful of losing his independence. Staff at the project were concerned they wouldn’t be able to support him there safely, as they were only staffed from 9 to 5, Monday to Friday and had very little support. Prior to discharge from hospital, discussions (both face-to-face and via email) were held between his medical team, the hospital and community-based palliative care teams, his local drug services, his GP, social services and his keyworker. It was agreed that John could return to his accommodation with social services providing support with shopping, cleaning and meals on wheels. However, soon after discharge John ended up back in hospital. His pain was proving difficult to manage, and he was struggling to pick up his methadone from the local pharmacy. Project staff, as well as John, were concerned that his friends were using his opiate pain medication, causing him to start injecting heroin again. He wanted to move somewhere he could be looked after and supported. The medical team were persuaded by his keyworker not to discharge him back to his previous accommodation and it was decided that he needed sheltered accommodation. An application was made for a place in sheltered accommodation but this was rejected as he was an intravenous drug user (IVDU). An urgent multidisciplinary virtual meeting was held (i.e. by email) which was coordinated by a healthcare professional with a particular interest in homelessness. This explored all options and prevented an unsafe discharge. John went into a hospice for a period of time to get his pain under control. A homelessness application was completed by his keyworker and John was moved to another project, which was staffed for 24 hours a day and provided his meals. His drug keyworker has arranged with the local pharmacy to deliver his twice-weekly methadone and other medications in a locked box. John continues to be under the care of the palliative care team in the community and if his situation deteriorates, they will support applications for continuing healthcare funding so that his needs are met in a timely way. As priorities and needs change, an early multi-agency response can help anticipate and plan for current and future eventualities. In John’s case, the keyworker was vital in ensuring that John’s housing situation was taken into consideration. As there was good communication between hospital and community services prior to John’s initial discharge, every effort was made to support his return home – i.e. to the project at which he was residing before going into hospital. Although this did not work out for him initially, further multi-disciplinary planning led to him residing in a more appropriate environment. Having specialist palliative care input, along with support from his GP and drug prescribing team, helped reassure staff at his new project of the kind of ongoing care and support John would be entitled to receive as his illness progressed. With continued substance use, management of John’s pain may prove difficult. Adopting a multi-disciplinary response that includes the specialist palliative care team could reduce potential risks arising from the combination of opiate pain medications and heroin, and help support the project in adapting any risk management plans when required. A palliative care team can also give advice and information about any aspect of a client’s care. ACP provides opportunities for clients to think about the kind of care and support they would like to receive (or not), particularly should their health deteriorate. It can be a very useful tool for you and others within the multi-agency team when assessing future care planning with clients, to ensure client’s wishes and priorities for care are known, particular if they are at risk of losing capacity. This short video from the Gold Standards Framework gives an overview of the stages of advance care planning and could be helpful for opening up discussions with clients. There are different aspects to ACP, some of which are legally binding, and a varied range of tools and templates within different locations and countries. Listed below are some of the main aspects of ACP. An advance statement, (sometimes called a statement of wishes) is a written statement that sets down what someone would like to see happen regarding their future care. This includes their preferences, wishes, beliefs and values. Anyone can make an advanced statement at any time, but it can be particularly important for someone nearing the end of life. The aim of the statement is to guide anyone involved in our care to know what our preferences and wishes are, should we lose capacity. It covers all aspects of our future health and social care, including where and how we would like to be cared for, (from wanting to be cared for at home, for example, right down to details like whether we prefer a shower or a bath). Anyone can assist us in writing it up, and though not legally binding, anyone making decisions about our care must take it into account. This is a decision any of us can make to refuse a specific type of treatment at some time in the future, should we lose capacity. This can include treatments such as ventilation and cardiopulmonary resuscitation (CPR), treatments that could potentially keep us alive, though it cannot be used to refuse basic nursing care to keep us comfortable. The form legally requires one signature, and once completed, informing our GP, or hospital medical team of the ADRT makes them aware of our decision. An ADRT is legally binding, and can take precedence over decisions made in our best interest by others. Everyone has the right to refuse cardiopulmonary resuscitation if they wish and can make it clear to their medical team that they don’t want to have CPR if they stop breathing or if their heart stops beating. This is known as a do not attempt cardiopulmonary resuscitation (DNACPR) decision, or DNACPR order. If someone has a serious illness or is undergoing surgery that could cause respiratory or cardiac arrest, their medical team should ask them about their wishes regarding CPR, if they haven’t already made their wishes known. Once a DNACPR decision is made, it’s put in someone’s medical records. A DNACPR order isn’t permanent, and someone can change their mind and their DNACPR status at any time. You may want to check your organisation’s policy on adhering to DNACPRs. A lasting power of attorney is someone we trust whom we can officially appoint to make decisions about our care and welfare, should we lose capacity in the future. We can also appoint an attorney to make decisions on financial and property matters. It is a legally binding process, and requires completing an LPA form. A will, sometimes called a last will and testament, is a legal document which sets out our final wishes regarding our estate, following our death. Our estate could comprise money, property and personal belongings we would like distributed among those whom we want to benefit from our estate once we are gone. If a client would like to make a will, it is possible to support them. Consider who you can explore advanced care planning (ACP) further with? What conversations with clients can be initiated by you, another member of the multi-agency team, or shared? An important feature of advance care planning is that, unlike general care planning, ACP enables clients to make specific choices about their future care, should a time come when they lose capacity to make decisions for themselves. It also allows them to appoint someone as an advocate, thus increasing the likelihood of these wishes being known and respected at the end of life. Mental capacity means being able to make your own decisions. Decisions deemed unwise by others do not necessarily mean that someone lacks the capacity to make them, and such decisions should be respected. There may be times when you are not sure whether someone has the capacity to make a decision. Guidance on assessing capacity is provided in the Mental Capacity Act (MCA) 2005. Mental capacity is an issue that impacts the homeless sector, particularly for those with chronic alcohol related issues, (such as hepatic encephalopathy or alcohol related dementia). With these conditions clients are likely to experience temporary or longer term confusion, difficulties in their thinking, or loss of mental capacity at some stage. Planning ahead for how clients would like to be cared for in the event of losing capacity is an important consideration, particularly as there is a potential risk for some to suddenly become unresponsive and slip into a coma. As someone caring for or supporting a person who may lack capacity, you or your colleagues may be able to assess capacity by following a two-stage test. The following information has been sourced from The Social Care Institute for Excellence and Mind. Stage 2: Is the impairment or disturbance sufficient that the person lacks the capacity to make a particular decision? Every effort should be made to find ways of communicating with someone before deciding they lack capacity to make a decision based solely on their inability to communicate. Also, you may need to involve family, friends, carers or other professionals. The assessment must be made on the balance of probabilities – is it more likely than not that the person lacks capacity? You should be able to show in your records why you have come to your conclusion that capacity is either present or lacking for the particular decision. For more detailed information you should refer to the Mental Capacity Act Code of Practice. Who can assess mental capacity? The MCA (mental capacity assessment) is designed to empower those in health and social care to do capacity assessments themselves, rather than rely on expert testing by psychiatrists or psychologists – follow the two-stage test. Good professional training is key. However, in cases involving complex or major decisions you may need to get a professional opinion. This could be a general practitioner (GP) or a specialist (consultant psychiatrist or psychologist). Record keeping – Precisely what you record, and when, will vary. As a general rule, there is no need to record assessments of capacity to take day-to-day decisions. The Mental Capacity Act 2005 (MCA) is designed specifically to empower and protect an individual who may be unable to make a decision because of the way their mind or brain is affected, for example, by illness or disability, or the effects of drugs or alcohol. For instance, a client with chronic alcohol related issues, such as advanced alcohol related liver disease or alcohol related brain damage, can experience difficulties in thinking; confusion and/or hallucinations; as well as loss of mental activity. These may be temporary or long term, depending on the severity of the underlying condition, and may require a capacity assessment. When should capacity be assessed? You may need to assess capacity where a person is unable to make a particular decision at a particular time because their mind or brain is affected by illness or disability, or by the effects of drugs or alcohol. Lack of capacity may not be a permanent condition. Assessments of capacity should be time- and decision-specific, meaning that whether you have capacity or not is dependent on when the decision needs to be made, and what the decision is. You also cannot decide that someone lacks capacity based upon age, appearance, condition or behaviour alone. The Mental Capacity Act is underpinned by 5 key principles. It is useful to consider the principles chronologically: principles 1 to 3 will support the process before or at the point of determining whether someone lacks capacity. Once you’ve decided that capacity is lacking, use principles 4 and 5 to support the decision-making process. Principle 1: Assume someone has the ability to make decisions unless otherwise proved. Principle 2: Every effort is made to encourage and support someone to make the decisions themselves. Principle 3: Decisions deemed unwise by others do not necessarily mean that someone lacks the capacity to make them, and should be respected. Principle 4: If someone is found to be lacking capacity, any decisions made on their behalf must be done in their best interest, following the guidelines set out in the Mental Capacity Act (2005). Principle 5: Determine the least restrictive options that would interfere less with a person’s rights or freedoms or action, including the need to decide or act at all. The MCA provides a non-exhaustive checklist of factors that decision-makers must work through in deciding what is in a person’s best interest. Take into account all relevant circumstances. If faced with a particularly difficult or contentious decision, it is recommended that practitioners adopt a ‘balance sheet’ approach weighing up both sides of the decision. Involve the individual as fully as possible. Take into account the individual’s past and present wishes and feelings, and any beliefs and values likely to have a bearing on the decision. Again, it is vital that you record your ‘best interest’ decision. Not only is this good professional practice, but given the evidence-based approach required by the MCA, you will have an objective record should your decision or decision-making processes later be challenged. It is important for the application of the MCA to have a fundamental understanding of the best interest principle. If a person has been assessed as lacking capacity then any action taken, or any decision made for, or on behalf of that person, must be made in his or her best interest (principle 4 of assessing capacity). The person who has to make the decision is known as the ‘decision-maker’ and normally will be the carer responsible for the day-to-day care, or a professional such as a doctor, nurse or social worker in cases where decisions about treatment, care arrangements or accommodation need to be made. Non-discriminatory – that is, your judgments should not be based on age, appearance or condition. Considering all relevant circumstances – identifying those issues most relevant to the individual who lacks capacity in the context of the decision being made. Regaining capacity – if the individual is likely to regain capacity in the future, is it possible to delay the decision until then? Permitting and encouraging participation – irrespective of an individual’s disabilities every effort must be made to communicate with the individual concerned. Special ‘key points’ for life-sustaining treatment – ensuring that where life-sustaining treatment may be in an individual’s best interest the person making the decision must not be motivated to bring about the individual’s death. The person’s wishes and feelings, beliefs and values – so far as reasonably can be obtained, consideration of the individual’s past and present wishes, feelings, beliefs and values should be taken. The views of other people – the Act establishes the right for family members, partners, carers and other relevant people to be consulted about the decisions being made. The Mental Capacity Act 2005 introduced the role of the independent mental capacity advocate (IMCA). IMCAs are a legal safeguard for people who lack the capacity to make specific important decisions, including making decisions about where they live and about serious medical treatment options. IMCAs are mainly instructed to represent people where there is no one independent of services, such as a family member or friend, who is able to represent the person. Capacity is an issue that may impact some clients, particularly for those with chronic alcohol related issues. Seek advice as early as possible from others within the multi-agency team, such as addiction psychiatrists, GPs, district nurses, or specialist palliative care nurses. Decisions about whether someone has capacity is both decision and time specific. This means a client may have capacity for some decisions and not others, and may vary during the day if they become intoxicated. Care Quality Commission and Faculty for Homeless and Inclusion Health, A second class ending: Exploring the barriers and championing outstanding end of life care for people who are homeless (2017).